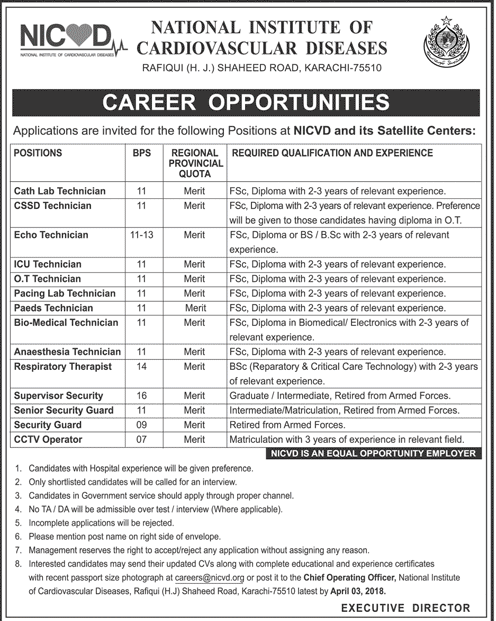 National Institute of Cardio Vascular Diseases has announced New Jobs in Daily Dawn Newspaper dated 21-03-2018. Applications are invited for National Institute of Cardio Vascular Diseases Jobs 2018 against the title of Cath Lab Technician, CSSD Technician, Echo Technician, ICU Technician, O.T Technician, Pacing Lab Technician, Paeds Technician, Bio-Medical Technician, Anesthesia Technician, Respiratory Therapist, Supervisor Security, Senior Security Guard, Security Guard and CCTV Operator. Incomplete or late received application will not be entertained. National Institute of Cardiovascular Diseases Jobs Daily Dawn Newspaper 21 March 2018.